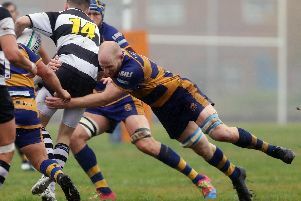 STRONG defensive play helped Gosport & Fareham end their run of defeats with a crushing 40-10 win at home to London Exiles. Head coach Barry Bridgman felt the result was one that had been coming for his side in London two south west. They had lost four on the bounce but performances were giving heart. The victory came in their final home game of the year. Bridgman said: ‘This is something that has been on its way and we managed to deliver it. ‘It was an outstanding win against a good side. ‘Defensively we were very good and that set the platform for our win. ‘Psychologically it gives us a huge boost and there was a real buzz about the squad afterwards. In the first-half, centre Wayne Dugan, prop forward Carl Dawson and skipper Wes Dugan scored tries. Wayne Dugan knocked over two conversions to give the hosts a 19-5 interval lead. In the second period the home side added further tries from winger Rory Penfold, number eight Sean Shepherd and Wes Dugan, with his second of the game. ‘Our next two games are against the teams at the bottom,’ said Bridgman. ‘If we can pick up 10 points from these it should see us in a comfortable position. Fareham Heathens bounced back from their double cup exit by beating Overton 33-5 in Hampshire one. Jashan Solanki proved the mainstay of the home side, contributing 18 points to their total. Director of rugby Bernie Rhodes felt Heathens were not on top form. Heathens opened their account with a try from scrum-half Dan Lee, converted by Solanki. The home side led 7-5 at the break but improved to pull away in the second period. Solanki went over for two tries, converted himself, with Steve Devoy and Johnny Stoppard adding two further touch downs.